...128 decibel warning blast at your finger tips! Air Horns: A safety upgrade for your Electra Glide. Not a cheap imitation, these Air-Horns provide a full 128 decibels of warning blast. AH-1: The trumpets, mounts and brackets are triple plated show chrome. 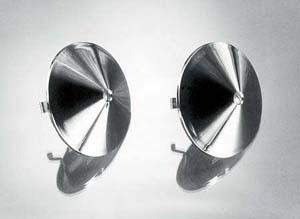 The Air-Horns are completely waterproof with cone shaped covers that mount to the front of the trumpets. 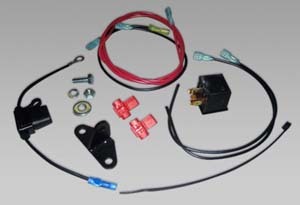 All kits include two horns, air compressor, relay, simple wiring and complete installation instructions. Two year unlimited manufacturers warranty. The air compressor creates instant air pressure to the horns. 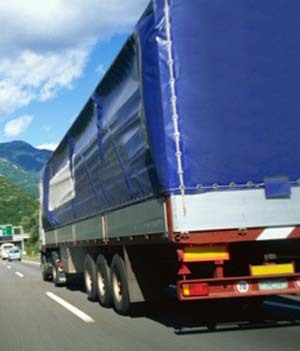 Since the pressure is created so fast there is no need for a storage tank as on trucks or RV's. This low pressure high volume air supply causes the diaphragm inside the horn to vibrate at a high rate of speed or "frequency". The exact speed at which it vibrates is varied by the length of the horn or trumpet. Together the horn set produces an extremely loud 128 decibel warning blast. This is approximately 4 times louder than most electric horns...which are usually at 87 decibels. AH-CC: CNC machined from steel and triple chrome plated, this cover dresses up your compressor when used in exposed locations. Recommended on Softails or Dynas if not mounting underneath the seat. 7742: One of the best & easiest to install air horn on the market. The latest in air horn technology, this Air Horn produces a powerful dual-tone air horn sound that is two times louder than the factory horn. The one-piece design requires no hoses & the heavy-duty, maintenance free compressor will provide years of dependable service. 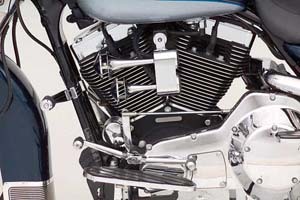 Comes with a sturdy bracket & plug-&-play wiring harness so you can mount the 7742 in place of the stock H-D horn without any fabrication & plug it in without having to piece together your own wiring to install the relay. Fits: ’92 - current H-D Models with stock cowbell horn. 7743: Get twice the output & a much better sound! Easy install, classy chrome cover, no hoses, & a heavy-duty maintenance free compressor will provide years of dependable service & incredible sound. Fits '92 to current H-D models with cowbell horn. 7732: Cover for 7742 horn. 7290: Get twice the output & a much better sound! This is the best & easiest to install air horn on the market. Plug-n-Play installation & a heavy-duty maintenance free compressor will provide years of dependable service & incredible sound. Featuring a 118 decibel -530/680Hz Dual-Tone Air Horn, you're sure to be heard! 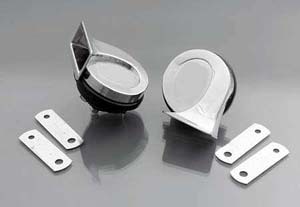 Fits: Universal mount for 3/4" to 1-1/2" diameter tube and Victory cruiser models. AH-40: Want to make sure you’re heard? Then these 115-decibel horns will turn some heads! 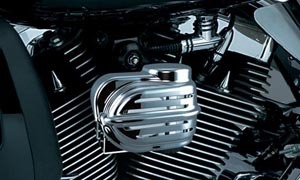 These trumpet horns won’t clutter up the side of that awesome V-Twin motor. 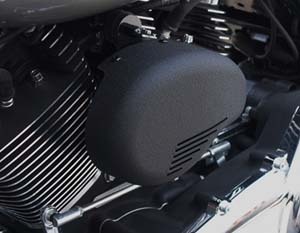 The unique mounting position behind the right saddlebag creates an enhanced blast when you sound the horn and removes the problem of bugs, water, and debris that plague other horns. 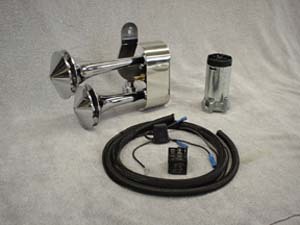 This chrome plated set includes a plug and play wiring harness that allows you to keep your stock horn if desired. 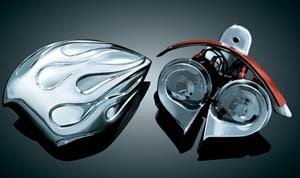 Fits: ’93-'08 Touring models (Dresser, Road King, Road Glide, Street Glide) Note: Compatible with or without H-D detachable accessories. Visually examine on-bike photo for possible interference. 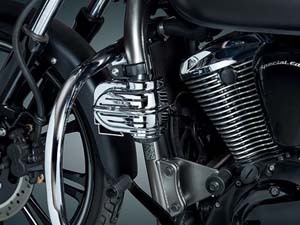 AH-MB1CA: Triple chrome plated aluminum cover for a beautiful, long lasting finish. This round cover has a classic old school look to it. Dimensions: 6-3/4" dia. x 3-1/2" depth. AH-MB1BA: Same as above but in wrinkle black powder coat finish. AH-2B: This self-contained air horn puts a heart stopping 132 decibel blast from its duel trumpets. 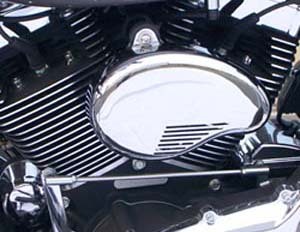 The steel horn cover provides a black wrinkle powder-coated finish that looks awesome on bikes that have more to offer than chrome. This unit is completely plug-n-play and comes with everything necessary for easy installation. This true air horn comes with a full 1-year OEM Manufacturers Warranty. AH-2C: Same as above in brilliant chrome. AH-2G: Same as above but in gloss black. AH-TC: This Air Horn has an oval shaped cover similar to that found on a Twin Cam 88 or 96 Air Cleaner. Provides great symmetry between the left and right of the bike. 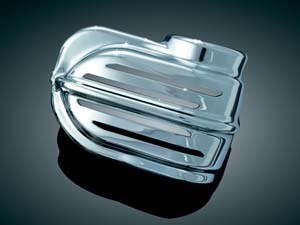 Features: The 18 gauge steel oval shaped cover is available in chrome, black gloss or black wrinkle finish. Heavy gauge steel mounting bracket. Easy plug-n-play installation. Bolt on installation. 3-year Manufacturers Warranty. Dimensions: 9" l x 5-1/2" h x 3-5/8"deep (excludes mounting tabs). 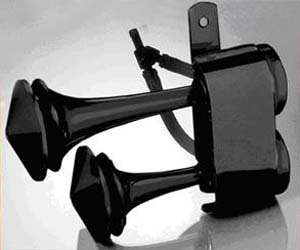 Custom Styled Electric Horns: These Custom Styled Electric Horns are our newst line of horns. While your stock horn gives off an estimated 85 dB of sound, the AH-2horn blasts 132 dB to let everyone know you’re there. Safety should be the primary concern for all motorcycle enthusiasts. This air horn helps insure your safety as well as the safety of other motorists around you. 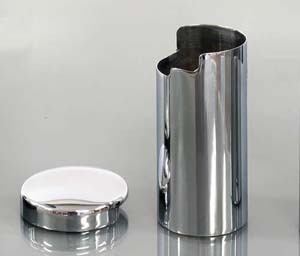 Available in wrinkle powder-coat, chrome or glass black. AH-3: Add as separate or supplement the AH-1, AH-2B,C,G with the AH-3 Electric Air Horns. 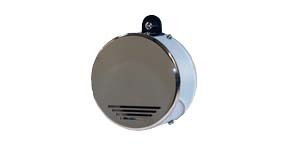 While not as loud as our premium air horns, with an output of 118 decibels these are the loudest electric horns you can buy, over three times as loud as most stock horns and a great economical choice....or just to add more sound to your existing horns. 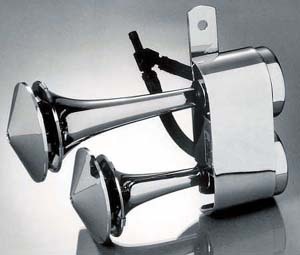 The set includes two chrome finish horns (one high and one low tone), mounting brackets and wiring kit and installation instructions. Mounts on lower right side of swingarm -- hidden installation. Kit also includes a relay and fuse. 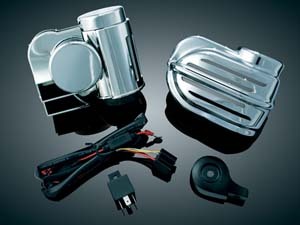 EH-270: Hardware kit used to install our AH-3 electric horns onto Harley Davidson's touring models. 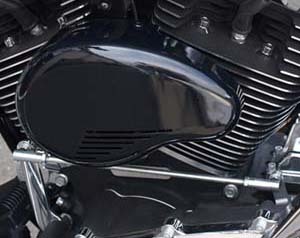 Mounts on lower right side of swingarm—hidden. Kits include a relay, fuse, all wiring and mounting hardware, along with detailed instructions. For model years '08 and earlier. EH-275: Same as above for MY '09 to current. 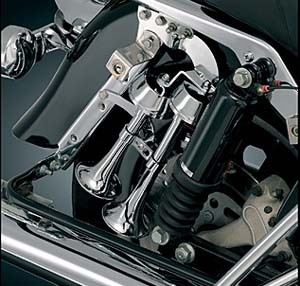 EH-500: Includes all required hardware and wiring to install our AH-3 Electric Horn Set on most other models of motorcycles. 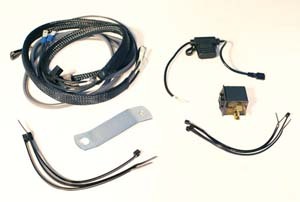 The kit includes relay, fuse, wiring, and mounting hardware, along with general instructions. 7298: Obtain some peace-of-mind for a practical price! With its loud yet appealing tone you’ll feel safer on the road & combined with the blazing chrome flames – you’ll look impressive too! Rated at 115 decibels, the kit is equipped with a pair of High-Low Tone electric horns (510/420 Hz). 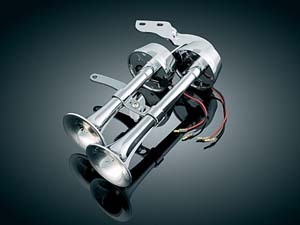 Includes mounting bracket, Horns, wiring harness & Flame Horn Cover. 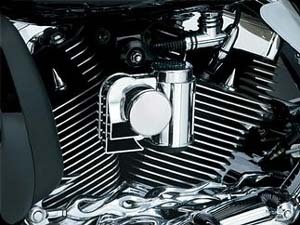 Bolts on in place of your stock cowbell & wiring is plug-&-play to ensure a low stress install. Fits: ’92-’11 H-D Models with stock Cowbell Horn. AH-MB1C: Triple chrome plated aluminum cover for a beautiful, long lasting finish. This round cover has a classic old school look to it. Dimensions: 6-3/4" dia. x 3-1/2" depth. AH-MB1B: Same as above but in wrinkle black powder coat finish. AH-R: This American-made, completely sealed relay will protect light-duty OEM wiring and switches (ex: horn button) from damage when adding accessories that draw high amounts of current. Strongly recommended for use with our AH-3 electric horn. 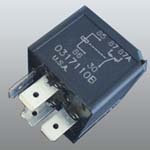 These relays are included with the AH-1 or AH-1B Air Horns to operate the compressor. AH-TC-C: Chrome only version like above but also with Chrome bracket.